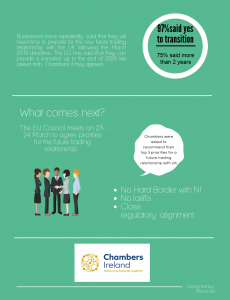 Ahead of the EU Council meeting scheduled to take place on the 23-24 March, Chambers Ireland published the results of a survey of the Irish Chamber Network, revealing that an overwhelming majority of Chambers (97%) believe a transition period following the UK’s exit from EU next March will be necessary. 75% of Chambers responding to the survey recommended that a transition period should last longer than two years. Chambers continue to believe that Brexit will be a challenge for their members, with three quarters of responses confirming that Brexit presents more challenges than opportunities. 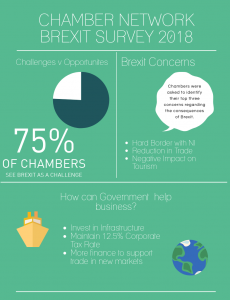 With regard to the consequences of Brexit, Chambers were asked to identify their three biggest concerns, which were as follows: a return to a Hard Border with Northern Ireland, a reduction in trade in goods and services and a negative impact on tourism in Ireland. 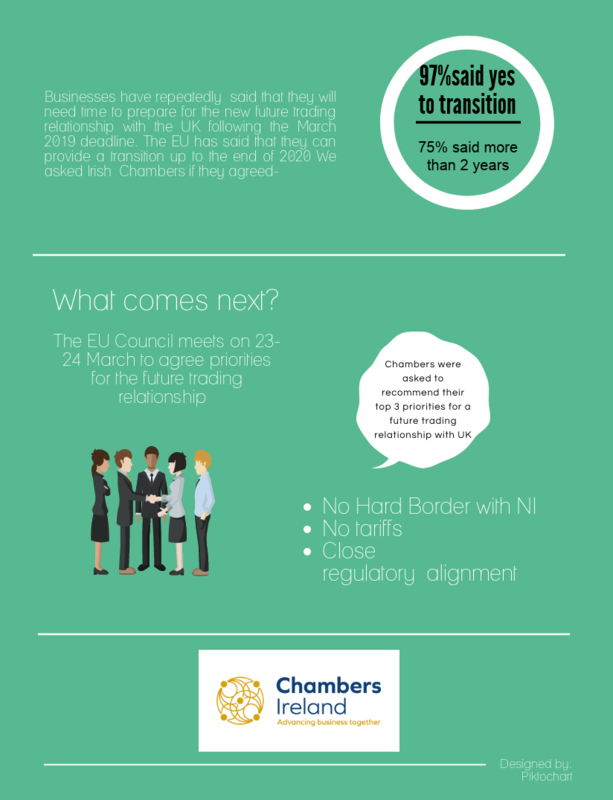 Chambers were also asked to outline their top three priorities for the next phase of negotiations on the future trading relationship. No hard border between Ireland and Northern Ireland, no tariffs between the EU and UK and ongoing regulatory alignment between the EU and UK were identified as the leading three priorities. When asked how Government should support business in the context of Brexit, responding Chambers identified the following as the best way Government could ensure Irish businesses are supported: ongoing increased investment in capital infrastructure; maintenance of the 12.5% corporate tax rate to secure increased FDI; and ongoing investment in trade finance to support market diversification. “Twelve months on from the UK Government’s decision to “trigger” Article 50, businesses are still no clearer on what the future trading relationship will look like. This is significantly impacting upon investment decisions and the future planning of operations for businesses. Despite the negotiating parties’ commitment last December to no Hard Border between Ireland and Northern Ireland, Irish Chambers remain concerned about the UK’s continued commitment to leaving the Customs Union and the EEA, and how this will impact trade between the two islands, the tourism sector and indeed our relationship with Northern Ireland. Urging businesses to plan for Brexit is important but realistically very few SMEs can afford the resources necessary to plan for the multiple potential scenarios which we continue to face. Clarity is desperately required. Government can of course do more to support Irish business. Delivering upon committed increases to investment in infrastructure, particularly our roads and ports, remains vital and will ensure that businesses are better placed to adjust to the post-Brexit trading landscape. Our ability to continue to attract foreign investment and our ability to diversify the markets in which we trade will be crucial if we are to maintain growth as an economy. As such, Government must focus on enhancing our national competitiveness and ability of Irish firms to compete abroad as much as possible in preparation for whatever form Brexit takes.